How to select a group within a “parent” group to move it around? I have Photoshop documents with layers organized into groups, and some of the groups are nested within other groups. When I move them around, auto-select is set to group. The whole "parent" group moves. I have 5 other groups within, which means all 5 are moving. This is not what I want. I would like to be able to select a group within parent/top group and move it individually. Everything inside a group will move together, that is the point of grouping objects. 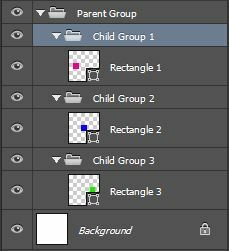 If you want to move a child group then you will need to select the inner group in the layers panel. Auto-Select will not select the inner groups but will only select the Parent Group. To select inner groups you must make sure Auto-Select is unchecked. Your groups might look something like this. 1 Parent group holding several child groups. You must manually select the inner group. Now everything in Child Group 1 will move together but Child Group 2 & Child Group 3 will not be effected. With the Move tool selected, hold Ctrl/Cmd + Alt and right click on the visible part of the layer and it will be selected and movable. Just the layer (not the group). Is there a way to scale layers relative to their individual boundaries in Photoshop?